On Tuesday, November 5th, 2013, the author of the book, Winter Cycling: The Definitive Guide To Cold Weather Winter Bike Rides, sat down and conducted an hour-long webinar about the secrets of cycling in the wintertime. How to stay warm (and comfortably cool) during your winter bike rides. How to dress properly for winter cycling. How to equip your bicycle for winter weather conditions. How to ride safely in rain, ice and snow. Winter means different things for different people in different parts of the world. There are three main layers that you should use to warm your upper and lower body. By changing the inflation pressure of your tubes/tires. By altering the type of rubber (or rubber formula) used in your specific brand of tires. By changing the tread pattern of your tires. Tread that is wide apart is better for mud and snow. Studded snow tires are good for ice and certain types of snow. The suspension or lack thereof on your bicycle. Your posture on the bike and general ability to ride with proper technique. Don’t be surprised if you crash at some point. You should almost expect it. Crashing isn’t as bad in the winter because you are covered up and following into snow doesn’t hurt as much. Stay as upright as possible. Avoid sharp turns. Don’t be afraid to get off and walk if the situation requires it. Holes and cracks in the road should be slowly steered around or driven straight over. If you are riding in deep snow, you are typically riding on snowmobile trails, cross country ski trails, etc. If you are breaking the trail, you shouldn’t expect to ride very much – even on a snow bike. Winter cycling can be dangerous, but it can also be a lot of fun. The more you do it, the more comfortable you will be. The following subjects were not discussed during the webinar, but are covered in great detail inside the Winter Cycling book. To learn more about winter cycling, or to pick up a copy of the Winter Cycling book for you or a loved on, visit the website at www.wintercyclingbook.com. 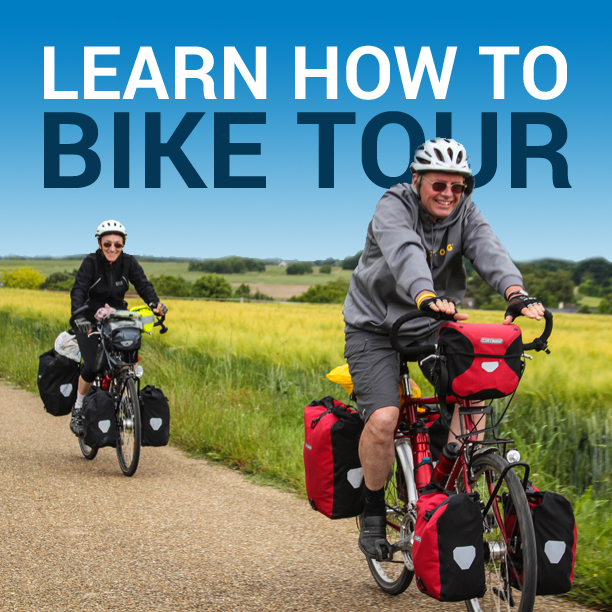 This entry was posted in Bicycle Touring Pro - Webinars, Bicycle Touring Pro Articles, Books, Featured Articles, Featured How-To Articles, Main Articles, Products, Safety, Videos and tagged fat bike, fat tire bicycle, snow bicycle, snow bike, winter bicycle touring, winter cycling, winter cycling video, winter cycling webcast, winter snow tires.